Leslie Harrison Lambert was a Foreign Office official, amateur magician, former Royal Navy officer and cryptographer in Hut 3 (the Enigma team) at Bletchley Park. Despite these accomplishments, he is better known today by his broadcasting pseudonym. As A J Alan, he made occasional broadcasts on the wireless in the ’20s and ’30s, spinning tall tales that he wrote himself and pasted onto large squares of cardboard so as not to disturb the audience with the sound of rustling pages. Lambert — that is, Alan — always turned up at the BBC in full evening dress, and with his own candle and matches as contingency in the event of a studio light failing. His yarns were immensely popular with radio listeners of the time. They are shaggy dog tales for the most part, often but not always steering away at the last moment from anything so vulgar as mere plot resolution. Some have a delicate touch of the supernatural about them, in the way a fellow might tell you about a real-life spooky experience. The stories are very effective at doing precisely what the storyteller intended, namely letting you pass an agreeable quarter of an hour in the company of an amusing raconteur who’s spinning an elegant verbal picture of how he went gadding about on various outré and/or outrageous adventures. Charming and whimsical, A J Alan deserves to find a new following among today’s readers and would surely be delighted to see his work launched in digital format, just as he pioneered the exciting new communication medium of his own era. 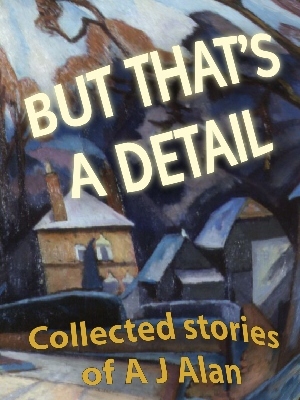 This book contains ten of A J Alan’s best stories: “The 19 Club”, “A Joy Ride”, “The Dream”, “Wottie”, “My Adventure in Norfolk”, “A Foggy Evening”, “My Adventure at Chislehurst”, “H2, etc”, “The Diver” and “The Hair”. Available on Amazon US, Amazon UK and Amazon Germany, they will appeal to anyone who enjoys the eccentric English surreality of the Binscombe Tales.